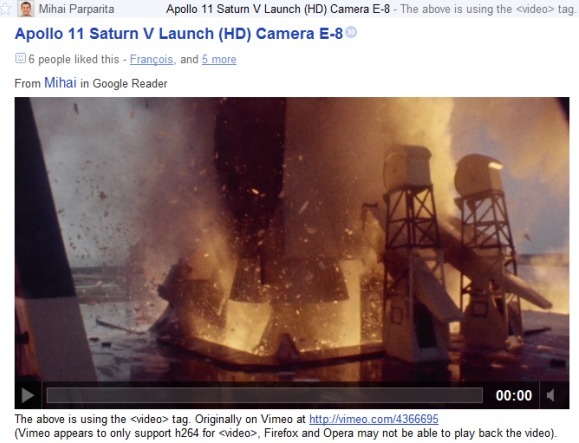 Google's feed reader started to support the video and audio tags from feeds. The only popular browser that doesn't support the two tags is Internet Explorer, but that doesn't mean that you'll be able to play videos without plug-ins in all the other browsers. As the screenshot below shows, Firefox and Opera don't support the H.264 compression standard, so you can't play videos from sites that only use H.264. Even if video sites like YouTube or Vimeo started to test HTML5 players, they don't offer the option to embed videos using HTML5 tags. What does that mean? I thought that audio and video tags were (or were not) supported by a given browser, not by a webapp. I thought that if a feed contains audio or video tags, as soon as you use a browser that supports them (and implements the right compression standard for the content of the feed), then you should be able to see that content, no matter the webapp you use (Google Reader, Netvibes, ...). Am I missing something here? Thank you! So, saying that Google Reader "supports" audio and video tags simply means that they added those tags to the list of "unfiltered" content from the feeds.